Coffee and theology, what more could you want? 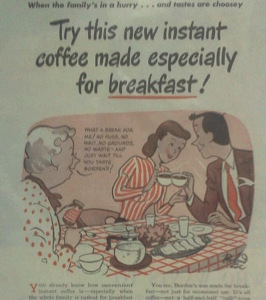 There’s no way that anyone could be that happy while drinking instant coffee. Over this past holiday season, I found myself in the coffee-machine sections of several retailers, in search of an espresso maker to give my mom. None of these stores had what I was looking for, instead, their shelves were well-stocked with assorted variations of Keurigs, Nespressos, and the accompanying accessories. For those who may be unaware, a Keurig is a coffee-making device that is designed for convenience. There’s a small reservoir which users fill with water every couple of days, and coffee – which comes in pre-measured little pods (“K-cups”) – is dispensed in seconds through a small valve. Clean-up is a breeze – when you’re done, all you need to do is throw away the used plastic pod.